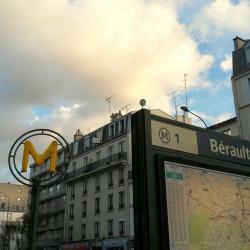 Looking for hotels near Château de Vincennes Metro Station? Aparthotel Adagio Paris Vincennes is located a 10-minute walk from the Bois de Vincennes and 3.1 mi from AccorHotels Arena, which is 19 minutes away by public transport. Located just 656 feet from Vincennes RER Station, this 2-star hotel offers soundproofed guest rooms with free WiFi. Facing the castle, the hotel offers comfortable and charming accommodation in the heart of Vincennes, one of Paris' rare bastions of greenery. Featuring free WiFi throughout the property, Meublés de Tourisme à Vincennes offers self-catering accommodations in Vincennes, 1312 feet from Château de Vincennes. Located in Vincennes, within a 13-minute walk of Château de Vincennes Paris, A 5 minutes de Paris offers accommodations with free WiFi and air conditioning. Located in the 12th district of Paris, Motel One Paris-Porte Dorée provides a garden and an on-site bar. Modern rooms,sparkling clean - good location near metro station i a nice part of the city. The Pink Hotel is in Paris’s 12th district, a 15-minute walk from the Bois de Vincennes. It features air-conditioned rooms, a bar and free Wi-Fi. Really friendly helpful staff - and the breakfast was wonderful! Set in the 12th district, this hotel with a 24-hour reception is located 0.9 mi from AccorHotels Arena and 1.2 mi from Gare de Lyon Train Station. Excellent value. Nice little room close to a wonderfully not-too-busy location. ibis Styles Paris Nation Cours de Vincennes is located a 12-minute walk from Place de la Nation. Very clean room. Perfect size room for a couple in this price range. Just in front of train station. Hotels with great access to Château de Vincennes Metro Station! Facing the castle, the hotel offers comfortable and charming accommodation in the heart of Vincennes, one of Paris' rare bastions of greenery. The people at the reception desk were very helpful! Located in Paris, Nouvel hotel is 1.3 mi from Opéra Bastille and provides facilities like garden and shared lounge. Located 1640 feet from Place de la Nation in Paris, alfa hotel paris nation is a nonsmoking property offering a 24-hour reception and luggage storage. All rooms are equipped with a private bathroom. Staff was very helpful and pleasant. Best Western Plus 61 Paris Nation Hotel is just a 2-minute walk from Place de la Nation and a 15-minute walk from The Bois de Vincennes. Was very close to a metro station, and not noisy at night. Good bed and pillows too. Ibis Styles Paris Nation Porte De Montreuil is located in Paris, 1.8 mi from AccorHotels Arena. Guests can enjoy the on-site bar. Everything was perfect. Staff, food and rooms. Good location near metro stop.